Bonita Lakes is an active lifestyle community located in sunny Bonita Springs, Florida. This community offers low-maintenance living with resort-style amenities great for any retiree. This gated community will offer 268 beautifully designed single-family homes upon completion. Besides the luxurious amenities offered in the community, Bonita Lakes provides scenic water views that can be seen from almost every home. The excellent location adds additional appeal to Bonita Lakes as it's close to many attractions, major highways, and shopping as well as just a short drive to both Naples and Fort Myers. 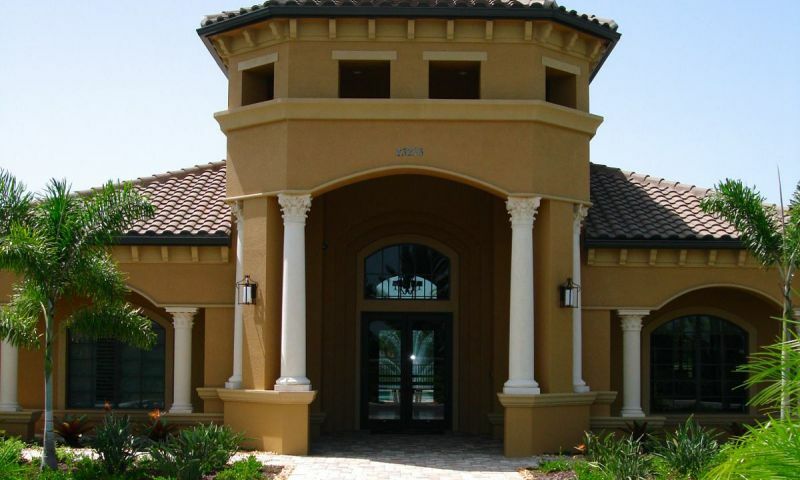 The beautiful clubhouse is the focal point for residents of Bonita Lakes. Here, residents can work out in the state-of-the-art fitness center equipped with all the latest in cardiovascular and weight-training machines. Residents can also enjoy a card game or start a club with other neighbors based on similar hobbies that will utilize the social room. The clubhouse also features a catering kitchen where homeowners can prepare a snack for a meeting or event. Outside of the clubhouse those wishing to cool off from the Florida heat can swim in the outdoor resort-style pool with lap lanes. They can also catch up on a book while relaxing on the spacious patio or covered lanais. The detached outdoor spa is another great area to soak and relax under the beautiful Florida sun. Residents can also stay active at the two lighted tennis courts or two bocce ball courts. Homeowners can enjoy the scenic beauty of Bonita Lakes with a leisurely stroll along the community's walking and biking paths. Bonita Lakes offers two luxurious single-family home collections that feature open floor plans designed with the active adult in mind. The Executive Collection offers models that range between 2,058 and 2,952 square feet. These homes have at two to four bedrooms, two to three bathrooms, and an attached two or three-car garage. All homes have first-floor master suites and a flex room that can be used as either a den or an additional bedroom. The Estates Collection offers a larger living space. Single-family homes in this collection range from 2,710 to 4,354 square feet and have three to five bedrooms, three to four-and-a-half bathrooms and an attached two or three-car garage. All homes come with well-appointed features such as granite counter tops, stainless steel appliances, tile roofing, and beautiful lake views. With a full-time activities director, Bonita Lakes will offer multiple clubs and activities for residents. Between fitness and card clubs in the clubhouse to tennis leagues outside, there is sure to be a social group for you. Homeowners have the luxury of more free time because of the homeowners' association (HOA). The HOA fee takes care of exterior-home maintenance, lawn maintenance, use of facilities, street lighting and street maintenance. Located in Bonita Springs, Bonita Lakes provides its residents with a great location on Florida's Southwestern coast. Just off Highway 75, Cape Coral and Fort Myers are quick trips to the north and Naples provides many choices for entertainment and culture just to the south. Outside of the community Bonita Springs offers residents convenient access to shopping and dining at Coconut Point Mall, Gulf Coast Town Center or the Miromar Outlets. Additionally, there are many beautiful beaches and challenging golf courses near the area. There are also plenty of local and state parks near Bonita Lakes like Estero Community Park, Bonita Beach Park, and Lovers Key State Park that are all within 30 minutes of the community. Resort-style amenities, along with well-appointed homes and an excellent location, make Bonita Lakes one of the most sought after communities in the Bonita Springs, Florida. There are plenty of activities available in Bonita Lakes. Here is a sample of some of the clubs, activities and classes offered here. The Executive Collection offers models that range between 2,058 and 2,952 square feet. These homes have two to four bedrooms, two to three bathrooms, and an attached two-car garage. All homes have first-floor master suites and a flex room that can be used as either a den or an additional bedroom. These homes are available on a resale-only basis. The Estates Collection offers a larger living space. These single-family homes range between 2,710 and 4,354 square feet and have three to five bedrooms, three to four-and-a-half bathrooms and an attached two or three-car garage. 55places.com is not affiliated with the developer(s) or homeowners association of Bonita Lakes. The information you submit is distributed to a 55places.com Partner Agent, who is a licensed real estate agent. The information regarding Bonita Lakes has not been verified or approved by the developer or homeowners association. Please verify all information prior to purchasing. 55places.com is not responsible for any errors regarding the information displayed on this website.